Which mistake was Obama’s worst? Was it causing people to lose their doctors? Was it raising their health care premiums by thousands? Doubling the national debt from 10 to 20 trillion dollars? Those mistakes can all be reversed. But what about Iran, the largest sponsor of terrorism in the world? Obama ended sanctions on Iran, and sent them $1.7 billion to help them to develop nuclear weapons. How do you reverse that? Well, that’s hard to fix.You might be curious about what Iran is doing with all that money. Well, they are involved in fighting the West in various places like Syria and Yemen, and they also sponsor terrorist groups like Hamas and Hezbollah. Denmark is leading a push for new E.U. sanctions against Iran, after its intelligence agencies blamed Tehran for a foiled plot to assassinate an Iranian dissident on Danish soil. The plot was already uncovered in September and triggered a massive police operation, in which Denmark shut down streets and bridges nationwide. Agencies revealed only this week that the operation probably had prevented what they say was a plan to kill a member of the Arab separatist movement ASMLA, which advocates for carving out an independent Arab state from Iran. A suspect of Iranian origin was arrested two weeks ago. Recall that Obama had to shut down an investigation of Iran’s involvement with drug smuggling in order to get his deal passed. It came out recently that Obama was so desperate to give the Iranian regime this money, that he actually stopped an investigation into drug-smuggling by Iran’s terrorist ally, Hezbollah. President Barack Obama torpedoed a DEA-led effort to stop Hezbollah from smuggling cocaine into the country. POLITICO broke the bombshell news Sunday night. The reason for allowing the Iran-backed terror group’s criminal enterprise to continue? 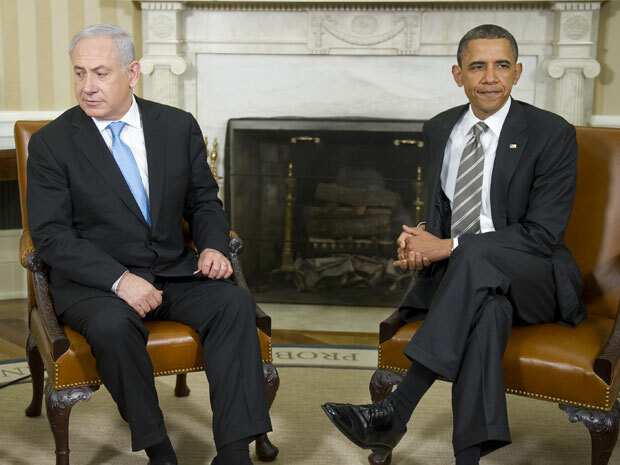 Obama’s desperate desire for better relations and a nuclear deal with Iran. The DEA teamed with dozens of agencies here and abroad in 2008 after discovering Hezbollah had grown beyond Middle East politics and thuggery into international crime. The special task force was called Project Cassandra. For eight years Project Cassandra worked to unravel Hezbollah’s drug and weapons trafficking, money laundering and other criminal activities. What should Trump do to roll back the damage that Obama did? Well, Trump already started by withdrawing from Obama’s Iran deal, but he can’t get back that $1.7 billion. That money is gone. But there is something else he can do… he can restore the sanctions against Iran that Obama lifted. Secretary of State Mike Pompeo argued that the new Iran sanctions – going into effect one day before the U.S. midterm elections – are tough enough to keep the Islamic Republic from pursuing a nuclear weapon. […]The Trump administration is reimposing a second round of sanctions against Iran on Monday after the president withdrew in May from the Iran nuclear deal, which was brokered by former President Obama. This all sounds good to me – at least America is leading from the front and battling against evil, using a mix of diplomacy, sanctions and military preparedness. Iran understands strength, and they’ll be much less likely to pursue terrorism, drug smuggling and assassinations now. It really does matter who is in charge. People who care about the harm that evil nations cause should vote for Republicans, so that evil nations are deterred instead of emboldened. Since we are seeing Trump reach out to pro-democracy protesters in Iran, it’s worth remembering how Obama responded to them in 2009. First, here’s what happened in Iran in 2009, just after Obama was elected president. The doctor who tried to save an Iranian protester as she bled to death on a street in Tehran has told the BBC of her final moments. Dr Arash Hejazi, who is studying at a university in the south of England, said he ran to Neda Agha-Soltan’s aid after seeing she had been shot in the chest. Despite his attempts to stop the bleeding she died in less than a minute, he said. Video of Ms Soltan’s death was posted on the internet and images of her have become a rallying point for Iranian opposition supporters around the world. […]Dr Hejazi said he saw Ms Soltan, who he did not know, with an older man who he thought was her father but later on learned was her music teacher. “Suddenly everything turned crazy. The police threw teargas and the motorcycles started rushing towards the crowd. We ran to an intersection and people were just standing. They didn’t know what to do. “We heard a gunshot. Neda was standing one metre away from me. I turned back and I saw blood gushing out of Neda’s chest. “She was in a shocked situation, just looking at her chest. Then she lost her control. “We ran to her and lay her on the ground. I saw the bullet wound just below the neck with blood gushing out. “I have never seen such a thing because the bullet, it seemed to have blasted inside her chest, and later on, blood exiting from her mouth and nose. President Obama said Tuesday that it would be counterproductive for the United States “to be seen as meddling” in the disputed Iranian presidential election, dismissing criticism from several leading Republicans that he has failed to speak out forcefully enough on behalf of the Iranian opposition. […]With protesters filling the streets of Tehran to denounce the declared outcome of the election, administration officials said they were wary of doing anything that would allow the declared victor, President Mahmoud Ahmadinejad, to portray the protests as American-led. Senator John McCain, Republican of Arizona, offered some of the sharpest critiques of Mr. Obama’s tempered response. Iran has seen thousands demonstrate following the election, prompting the regime to respond to public anger on Tuesday by offering a partial recount of votes in last week’s election. Supporters of both men have staged demonstrations, each drawing tens of thousands of people, but the event in support of the president was heavily promoted on state television, with all six channels urging Iranians to attend. The rival protest, by contrast, was officially banned and the regime tried to stop its opponents from communicating by blocking text messages and email accounts. Later on in his failed presidency, Obama would send $1.7 billion in cash to Iran to help them develop nuclear weapons, so they could destroy Israel a little faster. He made sure to include $400 million in unmarked bills, so that future administrations would not be able to back out of the “deal”. They followed cocaine shipments, some from Latin America to West Africa and on to Europe and the Middle East, and others through Venezuela and Mexico to the United States. They tracked the river of dirty cash as it was laundered by, among other tactics, buying American used cars and shipping them to Africa. This is the same Iran that imprisons Christian women in dirty prisons, funds Hezbollah terrorists, sends aid to Islamic terrorists in Iraq, Afghanistan and Yemen, and backed the corrupt Syria dictatorship. And more. I don’t have space to write all of what they do, but they’re one of the worst countries on the face of the planet. Not the people – but the Islamist dictators who run the show. Trump came out and expressed support for the Iranian protesters, for which he received widespread support from lawmakers and former government officials. Right now, half of the American public is so ignorant of national security and foreign policy that we elected an imbecile to the White House in 2008 and 2012. The idiots elected an idiot, and it was a disastrous eight years for liberty and peace. All I can say right now about Iran is at least the bleeding has stopped now that the grown-ups are back in charge. 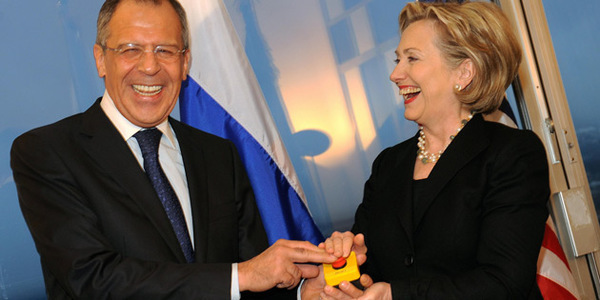 I guess everyone remembers how Hillary Clinton presented the Russian Foreign Minister with a “reset” button that they pushed together, signaling to the world that Democrat politicians wanted nothing to do with the view that there was anything morally wrong with Putin’s thugocracy. But all of a sudden, the same Democrats who bent over for Russia for eight years are complaining about Russia today. This article from National Review is a helpful reminder of exactly what the Democrats did with Russia during the last eight years. He reset with Russia shortly after its clash with Georgia in 2008. He concluded the New START agreement with Moscow that reduced our nuclear forces but not theirs. When candidate Mitt Romney warned about Russia in the 2012 campaign, Obama rejected him as a Cold War relic. The president then went on to forge an agreement with Russia’s ally Iran to allow it to preserve its nuclear program. During the red-line fiasco, he eagerly grasped a lifeline from Russia at the price of accepting its intervention in Syria. He never budged on giving Ukraine “lethal” weapons to defend itself from Russian attack. Finally, Obama cut U.S. defense spending and cracked down on fossil fuels, a policy that Russia welcomed since its economy is dependent on high oil prices. Put all of this together, and it’s impossible to conclude anything other than that Obama was a Russian stooge, and not out of any nefarious deals, but out of his own naivete and weakness. Obama didn’t expect any rewards when he asked then-Russian President Dmitry Medvedev during a hot-mic moment at an international meeting to relay to Vladimir Putin his ability to be more “flexible” after the 2012 election; he was, to put it in terms of the current Russian election controversy, “colluding” with the Russians in the belief it was a good strategy. His kompromat was his own foolishness. Now, I’m pretty sure that if you ask a typical Democrat, they won’t remember any of the things that Obama did to embolden Russian aggression in the last eight years. Obama was our President for the last eight years, and he supported our enemies (Russia, Iran, Cuba) and opposed our allies (Georgia, Ukraine, Israel). And now the Democrats complain about the evil Russians – the same evil Russians that they supported when they voted for Obama. They voted for the pro-Russia candidate and now they are complaining about the empowered Russia their President created. Obama sold our American foreign policy out for the Russians and the Iranians – that’s what Democrats voted for. TWICE. Most people on the left can’t remember what Obama did in the last 8 years with Russia and Iran. Democrat political views just consist of demanding taxpayer-funded condoms, so that they can get drunk, get pregnant with a hot guy, then kill the baby or go on welfare. There really isn’t anything more to being a Democrat than that. Democrats today look at Syria and don’t realize that their President has been backing the two biggest Syrian supporters for the last eight years: Russia and Iran. They complain about the very situation that they created when they elected an America-hating progressive. Is Barack Obama focused on protecting the American people and our allies? Why do civilized countries have a policy of not paying ransom to terrorists for hostages? Because if you pay them once, then it emboldens them to kidnap again and again. Anyone who knows anything about national security and foreign policy knows this: we do not negotiate with terrorists. But what happens if you elect a drugged-up community organizer who never released his college grades to be the first “affirmative action President”? […]“With the nuclear deal done, prisoners released, the time was right to resolve this dispute as well,” President Barack Obama said at the White House on Jan. 17—without disclosing the $400 million cash payment. […]Iranian press reports have quoted senior Iranian defense officials describing the cash as a ransom payment. The Iranian foreign ministry didn’t respond to a request for comment. […]Since the cash shipment, the intelligence arm of the Revolutionary Guard has arrested two more Iranian-Americans. Tehran has also detained dual-nationals from France, Canada and the U.K. in recent months. […]The Obama administration has refused to disclose how it paid any of the $1.7 billion, despite congressional queries, outside of saying that it wasn’t paid in dollars. Lawmakers have expressed concern that the cash would be used by Iran to fund regional allies, including the Assad regime in Syria and the Lebanese militia Hezbollah, which the U.S. designates as a terrorist organization. […]Iran has acknowledged providing both financial and military aid to Syrian President Bashar al-Assad and deploying Iranian soldiers there. Of course. Because appeasement of tyrants emboldens tyrants to be more aggressive. Anyone with the basic moral sense of a functioning adult knows this. […]Members of Congress are seeking to pass legislation preventing the Obama administration from making any further cash payments to Iran. One of the bills requires for the White House to make public the details of its $1.7 billion transfer to Iran. Republicans are trying to get answers, but the Democrats are hiding everything – just like they did with the gun-running to Mexican drug cartels, the unsecure Hillary e-mail server, the Benghazi cover-up, the IRS persecution of conservatives, and so on. Pompeo led several unsuccessful inquiries into the cash payout. He said the administration has been stonewalling efforts to obtain a full readout of the exchange in both classified and unclassified settings since January. […]“That is far too long of a timeline, especially as it is in the face of the Obama administration totally stonewalling congressional inquiries into this matter since January,” Pompeo said. None of this is surprising, given Obama’s other anti-American actions. We’ve already seen Obama release dozens of known Islamic terrorists who were captured on the battlefield – many of whom returned to battlefield to kill more Americans and innocent civilians. White House spokesman Josh Earnest said during Wednesday’s press briefing it is possible the $400 million that the Obama administration airlifted to Iran could have been spent on funding terrorism. What does Obama care? It’s not his money, it’s your money. 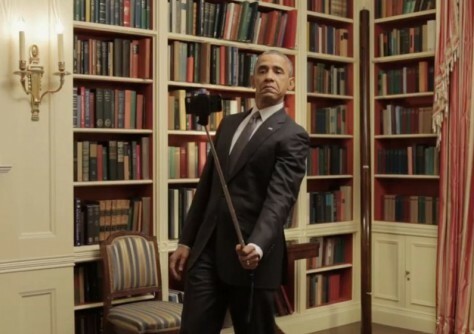 Pass the selfie stick and the golf clubs.